Festive Bulgur Mix | What Smells So Good? Mix bulgur with the spices, herbs and salt. Pour into a jar. 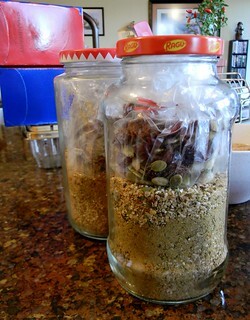 Combine the cranberries, sultanas, almonds and pumpkin seeds in a small bag and place on top of the bulgur mixture. Bring 2 ½ cups of water to boil in a saucepan. Add bulgur and spice mixture to the saucepan. Reduce heat, cover and simmer 15 minutes. Stir in the fruit, almonds and pumpkin seeds, re-cover and turn off the heat. Let stand 5 minutes, then fluff with a fork.